This website has been funded with the assistance of the European Union. The contents of this website are the sole responsibility of the Miami-Florida Jean Monnet European Union Center of Excellence at Florida International University and can in no way be taken to reflect the views of the European Union. 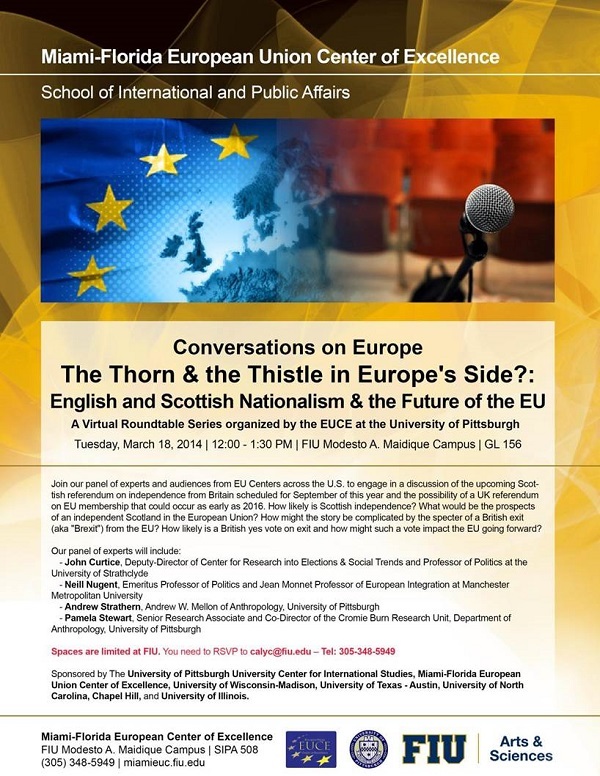 Conversations on Europe: "The Thorn & the Thistle in Europe's Side? : English and Scottish Nationalism & the Future of the EU"
Top British and Scottish experts will join specialists on the Nationalism & the future of the EU via videoconferencing across several sites. Join our panel of experts and audiences from EU Centers across the U.S. to engage in a discussion of the upcoming Scottish referendum on independence from Britain scheduled for September of this year and the possibility of a UK referendum on EU membership that could occur as early as 2016. How likely is Scottish independence? What would be the prospects of an independent Scotland in the European Union? How might the story be complicated by the specter of a British exit (aka "Brexit") from the EU? How likely is a British yes vote on exit and how might such a vote impact the EU going forward?